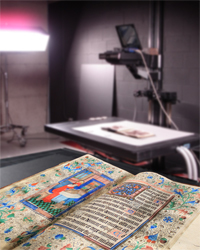 Digitized items from the Osler Library of the History of Medicine. Cartoons were typically printed as colour lithographs, or as hand-coloured wood engravings and used to promote over-the-counter medications directly to the public or advertise pharmacies. Often the comics would have an advertisement on the back. When we digitized the collection we were careful to preserve the relationship of the front and back items for context and study. 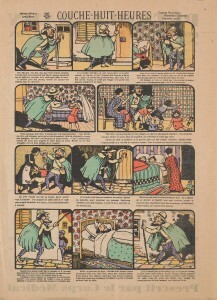 To find more comic strips you can search Osler’s collection of 2,500 digitized prints by the subject Cartoons & Comics . To see the real things visit the Osler Library of the History of Medicine and make an appointment. 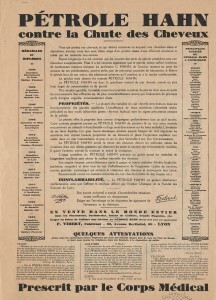 French advertisement on the verso of a cartoon entitled “Couche-Huit-Heures”. Advertisement for Pétrole Hahn, a product to fight hair loss.